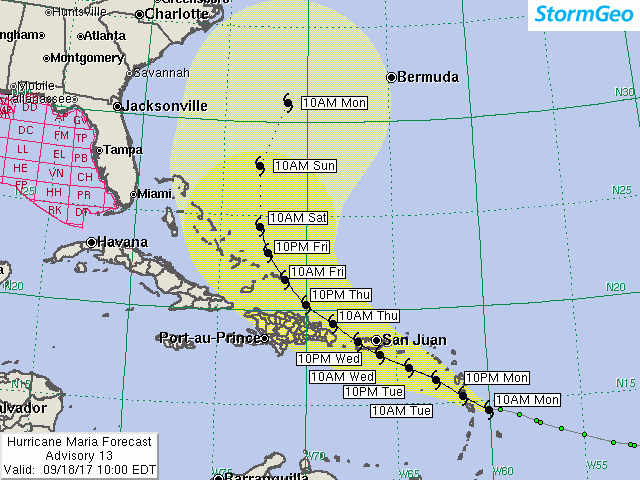 Crowley’s Corporate Emergency Management team is monitoring Hurricane Maria, a Category 3 hurricane tracking towards the Leeward Islands, US Virgin Islands, and Puerto Rico. The hurricane is predicted to strengthen to a Category 4 hurricane prior to landfall in Puerto Rico around 1000 EST Wednesday, September 20. Safety is Crowley’s No. 1 core value, and as such we are taking all appropriate steps to ensure the safety of personnel, including our mariners, all of our vessels, facilities and your cargo. We are coordinating with our vessels to review their routes and plans to keep them well clear of the storm. The following list contains information on those ports and facilities potentially affected by the storm. The port of San Juan, PR is open and operating under U.S. Coast Guard (USCG) Condition X-Ray, with Condition Yankee expected this evening at 2000 EST. Our St. Thomas and St. Croix offices and terminals will close at 1700 EST today, September 18. The port of Castiries in St. Lucia and our offices are closed today, September 18. We will continue to update you as port conditions change and as the trajectory of the storm continues to develop. For the latest information on our sailing schedule, please visit Crowley.com.